The Murrah Building bombing and the 1999 Moore, OK tornado are historical markers for even greater tragedy in the Britton family. Mother and father, Pat and J.P. (Joe Paul, Sr.) leave home early on April 19th, 1995 relying on their capable teenage sons Joe Paul, Jr. and Dale to take care of the ranch outside Perkins and their siblings, nine year old Thomas and eleven year old Henry. Pat and J.P. are overdue for a day together without the kids and plan to do some shopping in Oklahoma City and return home around eight pm. As news of the Murrah Building bombing breaks, Joe Paul, Jr. isn’t too worried about his parents since their plans didn’t include being in downtown Oklahoma City. When Thomas falls and breaks his arm after school, Dale called an ambulance, but can’t reach his parents who don’t carry a pager or cell phone. The boys, other family and friends await Pat and J.P.’s return to let them know what happened. As eight o’clock comes and goes and Pat and J.P. aren’t home, an investigation begins. When days turn into weeks, the Britton boys and other families in central Oklahoma discover an awful truth. A lot of people didn’t make it home after the Oklahoma City bombing, but not all of them went missing because of it. Follow this intense, four year investigation into the disappearance of six people from central Oklahoma which comes to a shocking conclusion as an F5 tornado sweeps through Bridge Creek and Moore on May 3, 1999. 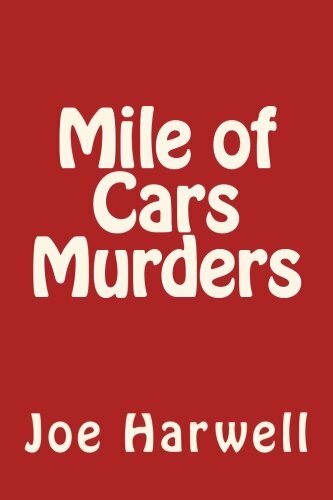 Mile of Cars Murders is the second novel in my Payne County Weekly historical fiction novel series. The characters are based on several from my 2012 novel, Payne County Weekly with several new characters added as the story unfolds. Joe Harwell’s family is from Mansfield and Huntington, AR. Although he grew up in eastern Oklahoma and now lives in Tulsa, he still considers himself an Arkie. After a career including retail management, coal mining, telecom sales, newspaper publisher, TV station owner and metal buying, Joe began writing and self-publishing novels set in Arkansas and Oklahoma in 2009. Four of his novels are historical fiction in a range of genres including viking vampires, the media, political corruption and the paranormal, plus one futuristic thriller about a Chinese super drug. Two more novels will be released in 2014 featuring serial killers and angels, demons and vampires. Long range projects include a novel about abuses of the mental health system, murder for hire, a zombie outbreak story set in western Arkansas and a movie script based on a 1976 concert in eastern Oklahoma celebrating America’s bicentennial.